They are resistant to virtually all acids, caustics and solvents commonly found in a laboratory, are scratch and impact resistant, stand up well to high heat and are non-flammable. We are the optimum provider of Corian Worktops from the most reliable vendors and are supplied with complete quality assurance. With our advanced facilities, we are able to provide highly sustainable products in wide various at the most reasonable market price range. shri sai kripa group is a leading provider and fabricator of granite, marble and sandstone. when searching or choosing for a kitchen countertops, granite kitchen worktops, solid surface countertops, tabletops, vanity countertop, always consider that good quality moulding & polishing adds beauty and value to home. 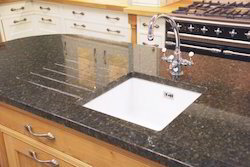 In order to keep pace with never ending demands of the customers, our company is instrumental in offering Granite Worktop. Worktops from across the design spectrum, including real stone Granite, sparkly stone composites, Corian Stainless Steel. - Take a look at our extensive range of Hanex kitchen worktop & countertop swatches & get some ideas to complement your interior design project. What is Hanex 100% Acrylic Solid Surface is an ideal material for residential and commercial applications because of its beauty, durability, aesthetics, design flexibility, the color choices available. It is a non-porous material.